Mardi Gras Queen mask is from Gypsy Renaissance's Mardi Gras Collection. 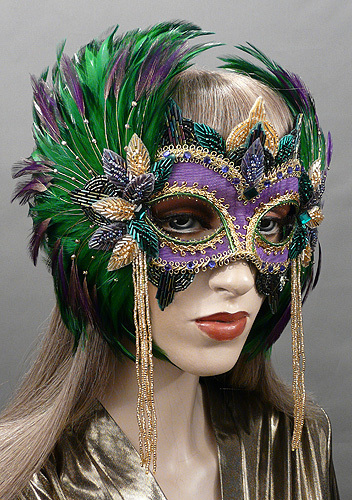 Mardi Gras Queen is a purple, green, and gold mask with feathers and beaded appliqués. Mardi Gras Queen mask is covered with regal purple moiré fabric and decorated with metallic gold and green braiding. Mask is adorned with two semi-circles of green feathers overlaid with purple wispy feathers. Mask is embellished with amethyst, emerald, and gold glass beaded appliqués and gold glass beaded dangles. Finished with amethyst rhinestones.